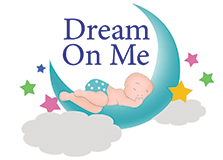 The Dream on Me Lullaby Cradle Glider 640,gently and with a gliding side to side motion soothes your newborn just like a Lullaby. Great for bedside sleeper but can be utilized in any room as the four hooded casters make for easy movement and lock for added safety. Inner dimensions of the Cradle measure 34.5 x 20.5 and includes a mattress pad. Gently glide newborn to sleep then stop the motion whenever needed. Cradle is made of solid pine and has a beautiful finish. Available in Cherry, Espresso, Natural and White. Assembly required.